Pennsylvania has more than enough sun, space and interest to dramatically increase the amount of energy it gets from solar panels by 2030, a study group led by the state Department of Environmental Protection reported Thursday. But those gains won’t be possible without policy changes that encourage more solar installations, especially large or “grid scale” projects that have been all but absent in the state so far. Currently, Pennsylvania gets only 0.25 percent of its electricity from solar panels mounted on rooftops and in fields. State law requires the solar share to climb to 0.5 percent by 2021. The DEP project, funded by the U.S. Department of Energy, sets a goal of producing 10 percent of the state’s electricity from solar power by 2030. To get there, the group recommends implementing some or all of 15 strategies, including boosting the state’s mandated solar share to between 4 and 8 percent by 2030, expanding loan opportunities and access to tax incentives to lower the upfront costs of installations, and adopting a carbon pricing program that would fund renewable energy projects. Getting 10 percent of Pennsylvania’s electricity from solar would mean installing about 11 gigawatts of new solar projects, compared to the 0.3 gigawatts of solar capacity installed in the state now. It would take about 124 square miles of land — or less than 0.3 percent of Pennsylvania’s total land area — to increase grid-scale solar to a level that would allow Pennsylvania to meet the 10 percent goal. The total investment for such a buildout, minus the savings that would come from buying less fossil fuel, would be about $9 billion over 15 years — or about 1.4 percent more than would otherwise be spent on energy in the state over that period. 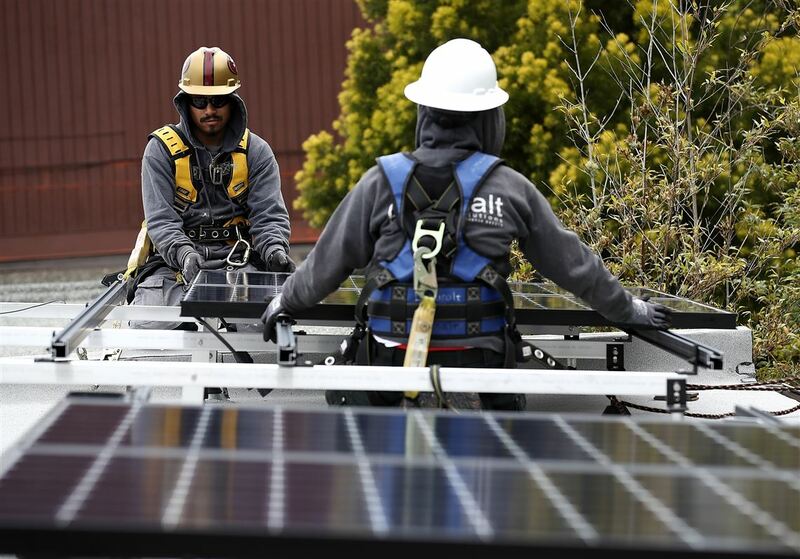 That small increase demonstrates that a shift toward solar “is economically viable,” the report said, and could create as many as 100,000 construction jobs. The economic benefits look better when avoided pollution is taken into account. Because the report expects solar to displace some electricity now generated by coal and natural gas power plants — which emit both conventional air pollutants and greenhouse gases that drive climate change — the environmental and public health benefits of shifting to solar would be over $1.6 billion a year. Pennsylvania has begun to take some steps to reinvigorate the state’s solar industry. Most recently, the General Assembly included a rider in a budget bill last year to require electric utilities to buy home-grown solar credits, rather than out-of-state credits, to satisfy the solar portion of the state’s renewable energy mandate.